One of the main benefits of staying in a rural luxury holiday rental UK is the proximity to meadows and fields that are home to sheep, lambs, cows, calves, horses, ponies and many wild creatures like hedgehogs, foxes, badgers, field mice, birds of prey, song birds…..the list goes on. Here at Meadowview Cottage you can watch Spring lambs playing, bouncing around and climbing on their mother’s backs from the comfort of your luxury holiday cottage. During the Spring, Autumn and Winter months renting a luxury holiday cottage in the country provides so much more to entertain you than a coastal home, where more often than not, there is little to do and see out of season. 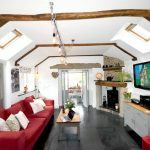 Our luxury holiday rental UK cottage is located at the end of a short lane in a tranquil and quintessential Cornish hamlet known as Trelash, just 10-15 minutes from the coast at Crackington Haven, Boscastle and further afield Bude, Widemouth Bay, Trebarwith…. Please check availability and prices or Contact Us using these links. We hope you accept our invitation to stay at Meadowview Cottage, our luxury holiday rental North Cornwall, UK and we look forward to greeting you on arrival.